Astronomy Today is honoured to speak to Dr. Takao Doi, a longtime member of Houston Astronomical Society (H.A.S), who has been designated by NASA to duties on a shuttle mission in 2007. This interview originally took place in 2003. On October 1, 2003 JAXA (Japan Aerospace Exploration Agency) was formed when the previous Japanese space agency, NASDA, merged with ISAS (Institute of Space & Astronautic Science) and NAL (National Aerospace Laboratory of Japan). Together these institutions ensure that Japan has many well trained and dedicated astronauts. Whereas Dr. Doi is the first Japanese astronaut to conduct a spacewalk, the first Japanese in space was a TV reporter, Mr. Toyohiro Akiyama, who flew aboard the Russian Soyuz vehicle in 1990. 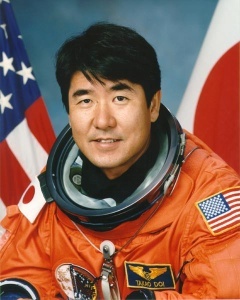 The first Japanese astronaut aboard the US Space Shuttle was Dr. Mamoru Mohri (STS-47, September 1992). At this time, Dr. Doi supported the Japanese experiments from the ground as a back-up payload specialist. He tells me that originally it took two years to select astronauts. This selection process has now been reduced to six to twelve months. Three years ago, Dr. Doi made the following comment: "We can divide our astronauts' jobs into two categories. The first is our assignment as a crewmember for a Space Shuttle mission. While we are assigned to a mission, our primary job is training for that specific mission. If we are not assigned to a mission, we do a variety of other jobs. For example, in my case, I work for the development of the International Space Station training as a mission specialist concerning the operation of the Space Shuttle and at the same time I train for the International Space Station. I am sure that I will work on board the Space Station in the near future." Now, after three short years, Dr. Doi has this ISS assignment. "In 1983, the National Space Development Agency of Japan (NASDA) announced that it would recruit three Japanese astronauts (payload specialists) in order to conduct the first Japanese space experiments aboard the Space Shuttle. I applied for it and that was the start of my career." There was an unfortunate delay in your career at that time, wasn't there? "Yes, three months after I was selected by NASDA in 1985, the Challenger accident occurred. I became extremely depressed since I felt that the future of space development looked dark, however in 1988 the Space Shuttle program resumed and I felt more positive about the future of space development." What was the next step in your training? "Eleven years passed since my selection as an astronaut by NASDA until I was assigned as a crewmember on the STS-87 mission on which I would conduct an EVA (Extra Vehicular Activity). I felt so lucky because an EVA would become an important skill for the future enabling me to assist in building the ISS and opening the door for future Japanese Astronauts to perform EVAs. I was very excited in that my EVA experience would contribute to Japanese and US manned space activities." Twelve years flew by until the launch of the STS-87 mission. "Yes and during that time I had a lot of experiences. I am very satisfied with this job because I have been working on the cutting edge of the latest manned space activities." Dr. Doi, what type of preparation was involved besides the obvious required training from NASA? For instance, is there any type of psychological testing to make sure one doesn't "go bonkers" in space? "In this line of work you must be true to yourself. In space, we encounter unexpected things so you must be able to believe in yourself and do what you think is right. You also must be healthy in order to fly in space. We exercise regularly." Tell me about your last thoughts as you were being suited up and then upon being jettisoned into space? What does one do while waiting? "The Space Shuttle Columbia (STS-87), lifted off on schedule. I waited for the launch aboard the Shuttle about three hours. During that time, I calmly thought about my career and all the training I had received. We reached space in 8 minutes and 30 seconds. During the launch I sat mid-deck with Leonid Kadenyuk who was the first Ukrainian astronaut. We shouted, 'Go! Go! Go!'. We were very happy. When the main engine stopped, and I started floating I realized that I was in space." ... and when you got back to earth? What was the first thing you did? "I opened the circuit breaker in the cockpit, and cut the power to the shuttle's landing gear and then felt I was home." What lesson did you bring back with you and would like to reveal to your fellow earthlings? "I rediscovered the beauty of the Earth during my flight: the glittering blue ocean, white clouds changing their shapes every moment, and the land where we live. The shining Earth in the pitch-dark universe was divine. I am very proud to be born on this Earth." What are your hobbies and favorite pastimes? Do you have any pets? How do you spend your time outside of work? "Whenever I find time, I like to observe the stars and universe. My wife and I have three cats." I always like to ask about favorites. What is your favorite star, constellation, or star formation? "My favorites are the Orion of winter, the Lyre of summer, the Milky Way, and galaxies." As a young schoolboy, did you ever think you were headed for a space adventure? "When I was in eighth grade, my friend asked me to observe sunspots with him. Soon after I got a telescope and have loved star gazing ever since. In 1971, I observed Mars and the M13 star cluster with a 20cm reflecting telescope. Around that time I started thinking that I would like to work in a space-related field and dedicate my life to solving the mysteries of space." What personal goals do you have? Is there anything else you would like to accomplish? "Astronaut" is a tough act to follow! "I am also interested in astronomy. I would still like to solve the mysteries of the Universe. (Note: Dr. Doi also has a PhD in Astronomy from Rice University.) One of my dreams is to walk on the Moon some day. "I am following my dream about space. Therefore, I would like young people to find out their favorite things and dreams and to make the effort to realize them." ... and how long will your space tour last? "The average mission lasts ten days to two weeks. I know I will enjoy every minute of it." The affable Dr. Doi is the first crew member assigned to the Space Shuttle crew that will deliver the first module of the Japanese laboratory, Kibo, to the International Space Station. His duties involve attachment and initial set-up of the Kibo Japanese Experiment Logistics Module. A tall order for a very well prepared professional and most deserving individual.